There was only one Johnny Most, and there will never be another like him. Talk about a Homer! He was one to the bone. To him, the Celtics never did anything wrong, and he compared the opposition to a group of uncouth thugs. Particularly the Bad Boy Detroit Pistons! He loved his team. Russ, Big Red, Jarrin' John, High Henry - he had nicknames for most of them. The video below is classic Johnny. He is on a tirade. Bill Laimbeer, Dennis Rodman, Rick Mahorn and Isiah Thomas are all targets. It is well-worth watching by old-timers and youngsters that never got to see, and hear, him. I later years, Most became wheel-chair bound prior to his death, but as he stated, the mouth still worked. 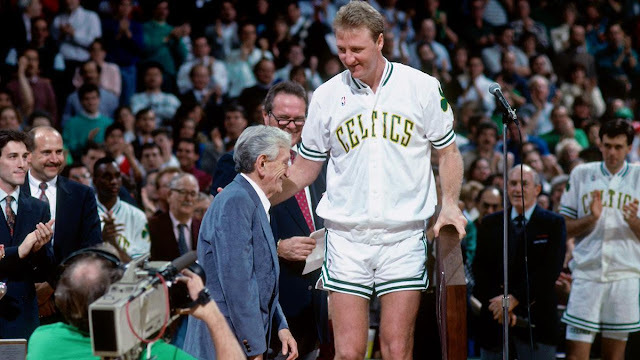 He never lost that sharp edge and his love for his beloved Celtics. Note: I wish to thank those readers that responded to my What are we missing? article and gave your thoughts. We write for you, and we need to know your interests.